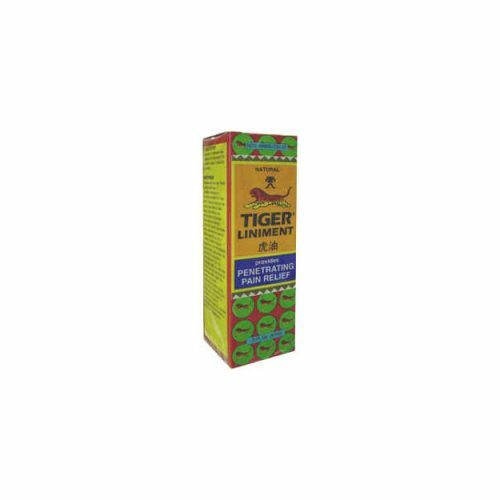 Tiger Liniment’s concentrated formulation penetrates quickly and provides effective temporary relief. Non-staining. Provides temporarily relief for aches and pains of muscles and joints due to the following indications. Tiger Liniment’s concentrated formulation penetrates quickly and provides effective temporary relief. Non-staining. Provides temporarily relief for aches and pains of muscles and joints due to the following indications. For external use only. Avoid contact with the eyes. If condition worsens or symptoms persist for more than 7 days or clear up and occur again within a few days, discontinue use and consult a physician. May cause an allergic reaction in some individuals with sensitive skin. Test on small area before use. If severe irritation occurs, discontinue use immediately and consult a physician. Do not apply to wounds or damaged skin. Do not bandage tightly. As with any drug, if you are pregnant or nursing, seek the advice of a health professional before using this product. Keep this and all drugs out of reach of children. In case of accidental ingestion, contact a poison control center or physician immediately.